Mini episodes bundled with Blu-rays and DVDs. Edit Notice: Apparently I listed the incorrect episode one. I've updated my review to reflect what the episode was actually about. 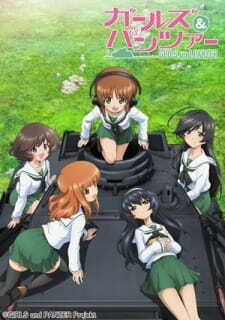 The specials are definitely a great watch for anyone who enjoyed Girls und Panzer. There's side stories, sequel episodes, and episode additions. Overall the mood of the specials felt a little different from the feel of the show but they were just as enjoyable. EP 1: The girls spend their time picking out swimsuits before they go to the beach. What really stands out here is the originality of the swimsuits that are showcased. I got a good laugh at the ending. EP 2: A standard camping episode with a bonus of everyone deciding to be in swimsuits. EP 3: The most interesting episode by far. They go into detail on answering questions you may have about the series and school ships. EP 4: A full presentation of the Anglerfish Dance that had to be performed after losing the school's first match. EP 5: An addition to the match against Pravda High that follows Yukari and Riko on their scouting expedition. This one was a lot of fun. EP 6: And to wrap it all off, a sequal episode where the student council hosts a celebration for winning the championship.